Montreal Canadiens forward Brendan Gallagher will be out at least eight weeks after having surgery to repair a broken left hand. The team made the announcement Thursday. The 24-year-old was injured when he was hit by a Shea Weber shot on Wednesday. The Habs were facing off against the Dallas Stars and took the 4-3 overtime victory, but losing Gallagher is tough. The forward missed 29 games last season after breaking two fingers in his left hand. That time, he blocked a shot by New York Islanders defenceman Johnny Boychuk in November and had surgery the following day. The Canadiens are already making do without Andrew Shaw, Alex Galchenyuk, David Desharnais, and defenceman Andrei Markov. On the plus side, Markov and Galchenyuk returned to practice on Friday in non-contact sweaters. Galchenyuk and Desharnais have been out with knee injuries since early December and were given recovery times of six to eight weeks. Gallagher has 18 points in 39 games this season, including six goals. He was receiving good time on the power play, skating with Max Pacioretty, Alexander Radulov, Nathan Beaulieu and Weber on the top unit. Galchenyuk or Shaw will likely fill the space when they return, but for the time being Montreal will have to shuffle the deck a little. Call-ups from the AHL are certainly in order, with Nikita Scherbak set to make his NHL debut when the Canadiens face off against the Toronto Maple Leafs on Saturday. 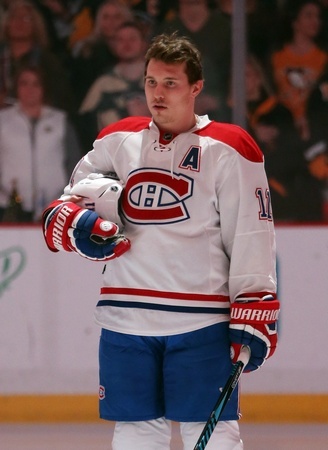 Sven Andrighetto was also called up from St. John’s. By the way, Gallagher is far from the first victim to be felled by a Shea Weber shot. There’s a long list of players beaned by his bomb and injuries aren’t uncommon, as you can see via this link.